Emacs is an open source text editor that has been described as "timeless and infinitely powerful." Even though Emacs was created in 1976 (! ), it's still one of the most popular text editors around, mainly because of how easy it is to customize! You can make your Emacs look and behave exactly as you want it to. Between its popularity and extensibility, if you see a cool feature in another text editor that you want to steal emulate, someone in the Emacs community has probably already done the dirty work for you. 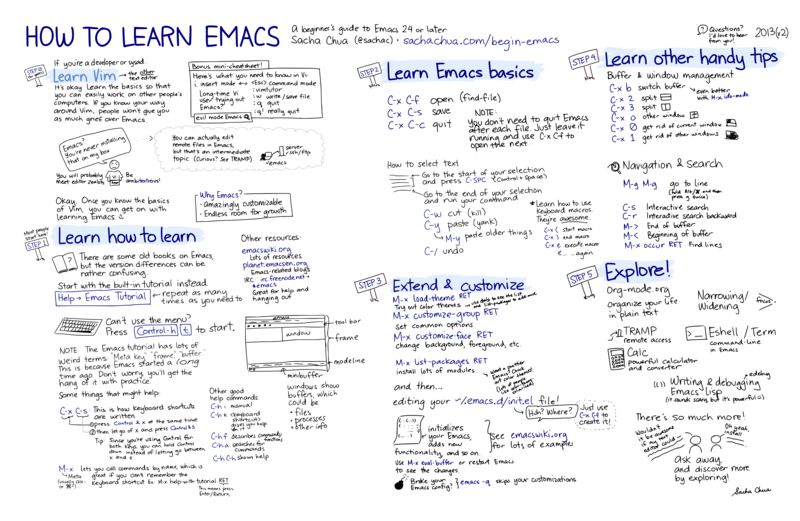 Getting started is pretty easy in Emacs, although becoming a pro will take a bit more work. Today, we'll just be introducing you to the basics. By the end of this guide, you'll be able to open Emacs, create a new file called greet.py, write a function greet, and run it from your terminal. Windows: Scroll to the bottom of the Emacs website and download the file called "emacs-24.3-bin-i386.zip". Unzip the file, and you should be able to run it right away. MacOS: Good news! Emacs comes built-in -- just type emacs into your terminal. It's pretty plain, so some people have created a nicer version here. Click the huge download button and follow the directions that pop up. After this, you should have Emacs in your Applications folder. If you're having trouble, there's a more detailed walkthrough on YouTube here. Ubuntu: The easiest way to install Emacs on Ubuntu is to type sudo apt-get install emacs into your terminal. Let's try opening Emacs from the command line. To create a new file, you have two options. While holding down Control (Ctrl), hit the x key. While still holding Control, hit the f key. A prompt will appear in the bottom area. This region is called the minibuffer. Type in greet.py and hit enter. Type greet.py into the minibuffer and hit enter. The Emacs window should turn into a blank page -- you're looking at the newly created greet.py file! In the future, whenever you want to open Emacs to edit a file, you can type emacs greet.py & into your terminal. If the file that you want to edit doesn't exist yet, Emacs will create it for you. If you already have Emacs open, you can just use the same C-x C-f shortcut. Now, let's write a simple program that greets you by name. Don't worry if you don't understand the program yet! We'll learn what each of these pieces mean in more depth in the next few weeks. You'll notice that certain words are colored differently, like def and print. Emacs looks at the .py at the end of the file name and knows that you want to write Python, so it will highlight special words for you. Syntax highlighting makes programs much easier to read! To save your program, use the keyboard shortcut C-x C-s or navigate to the File menu and hit Save. You'll know it worked if Emacs tells you "Wrote /some/directories/greet.py" in the minibuffer. Now exit Emacs, either using the shortcut C-x C-c or finding File -> Quit on the menu. Let's actually make Python do some work! Make sure that you're in the example directory, which contains our greet.py file. Then, type this into your terminal. Hey Brian, how are you doing today? and suddenly, Python knows how to greet you! Hey John, how are you doing today? Congratulations, you've edited your first file! This process of editing a file and running it will feel more natural as the course progresses. To exit the Python interpreter, you can type in exit() or quit() into the interpreter or hit C-d.
Everything you've learned so far is enough to get you through 61A. 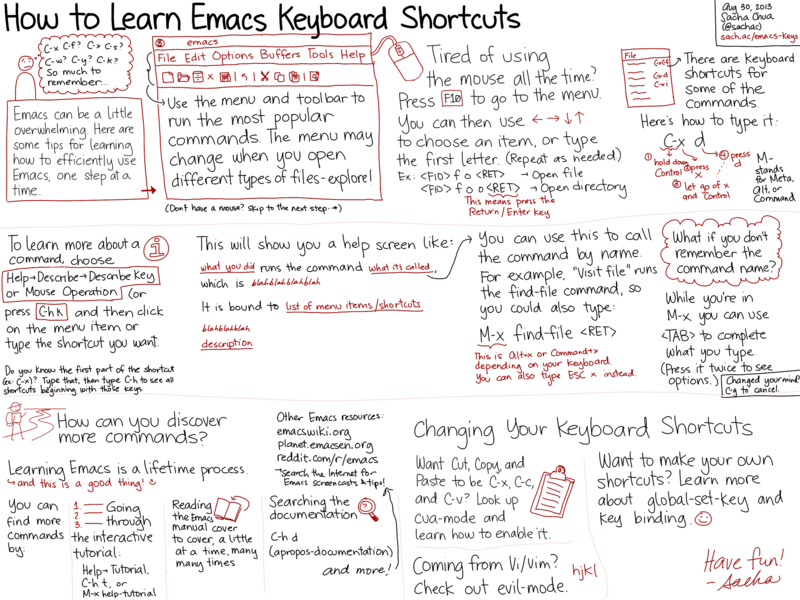 To get the most out of using Emacs, though, you should become more proficient with Emacs' keyboard shortcuts. If you ever get the chance to watch a pro use Emacs, you'll notice that she never uses the mouse -- everything she does is via shortcuts. Emacs has a wide variety of shortcuts that will help you do pretty much anything. You might remember from above that C-x means: while holding Control, press the x key. Similarly, C-s means: while holding Control, press s. Together, the shortcut C-x C-s means to do C-x, then C-s. Some shortcuts involve the Meta key, like the shortcut to copy the highlighted region of text: M-w. Most keyboards these days don't have an actual Meta key, so we use the Alt key instead. (If you're on a Mac, use Cmd.) To execute the copy command, hold Alt and press w.
One of the most common Meta key shortcuts is M-x. If you hit M-x, the minibuffer will prompt you for the name of a command. Try M-x doctor or M-x snake! As you've probably noticed, the shortcuts for Emacs are quite different from the ones that you're used to. You'll find that Emacs shortcuts are actually pretty common in the programming world. For example, try typing python3 -i greet.py into your terminal, without hitting enter. What does M-b do? It does the same thing as it does in Emacs, which is go backward by a word! Try M-f too. If you'd like to enable things like C-c and C-v for copy and paste, you can turn on CUA keys by finding it in the Options menu. I'd recommend trying the Emacs way, though! Emacs has a ton of informative "help" commands. You can get more information about any command or keyboard shortcut. The best part is that Emacs is self-documenting -- there's no need to open up something else to get help, since it'll show up right inside Emacs! C-h t will start up the Emacs tutorial. Going through this is highly recommended, as it will help you become more proficient with the various movement keyboard shortcuts. It's a bit long though, so you might not be able to finish it in one sitting. C-h f will prompt you for the name of a function and return its docstring. C-h k will prompt you for a keyboard shortcut and return its doctsring. C-h t: it's good for you! a comprehensive advanced beginner's guide here: goes over a lot of Emacs terminology, which is good but might be overwhelming. your favorite search engine has the answers to almost any Emacs question you have!